Located in an industrial park on the outskirts of Ventura, The Cave is a hidden gem worth discovering. The Cave is hidden deep inside The Ventura Wine Company retail wine shop, but don't be fooled by the plain exterior. Opened in 2008, The Cave has been pleasing palates and wetting taste buds since it's inception with some of the best food and wine around. Every first Tuesday of the month the small-plate menu offering changes as do the 40 wines available for tasting by the ounce or by the glass. Nick Fisher was the original mastermind behind both Ventura Wine Company (a warehouse retail wine shop offering competitive and honest prices without the frills or club membership requirements) and The Cave's design and concept. 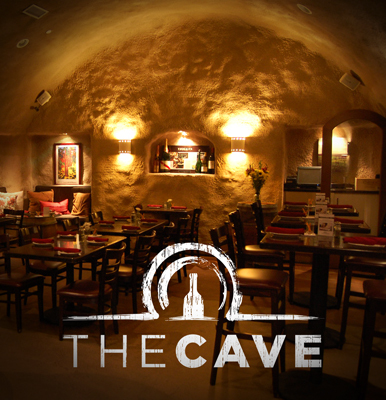 The Cave was created to bridge the gap between the causal or beginner wine drinker and the connoisseur or foodie. It presents 40 wines by the glass, bottled beer, Champagne and port or dessert wines and non-alcoholic beverages that can easily be paired with the ever changing menu of small plates, pizzas, salads, and burgers created in our small kitchen. The attached retail store has an inventory of over 1000 wines and guests are encouraged to select a bottle and bring it over to The Cave for enjoyment. and a $10 corkage fee on Friday and Saturday nights after 6pm. The corkage fee is waived for the first bottle during Happy Hour - Tuesday through Friday 3pm -6pm. There is a $15 corkage fee on all bottles brought from home at all times. Nick's daughter, Nicole Valdivia, has been managing the daily operations since 2008 and recently completed a private dining room (the Barrel Room) and expansion of the restaurant. The Barrel Room offers guest the ability to reserve the space for their large groups, or rental the room to host private parties, meetings or events. The Ventura Wine Company is proud to offer Ventura County's largest selection of fine wines always at competitive prices. Our 3000 square-foot showroom includes more than 2500 different wines to choose from, with new arrivals coming every week. Our focus is on California/American wines, which make up about 90% of our selection. In addition, we always carry a variety of wines from France, Italy, Spain, Australia, Chile and other countries around the world. We also stock a selection of fine Champagne and Sparkling Whites, Selected Craft Beers and a very limited selection of Sake for your enjoyment.